England centre Manu Tuilagi has rejected a lucrative offer from French club Racing 92 and signed a new deal with Leicester Tigers. Tuilagi's contract ran out in the summer and he had been to France to discuss terms with Racing. But the 27-year-old told the Tigers website: "This is a massive club and it means a lot to me and my family. "I love the club and I want to repay the loyalty they have shown me in my time here." The length of his new deal with the Premiership side has not been revealed. Tuilagi has spent all his career with Tigers. He made his debut in 2010, with the first of his 31 England appearances coming the following year. "I'm very passionate about playing my part in bringing back the success we all expect at such a massive club," he added. "This was a big decision for me to make but I am very happy to be able to stay here, I have a lot of friends here." A move to France could have seen his international career halted, with the Rugby Football Union only selecting players who play domestic rugby in England. 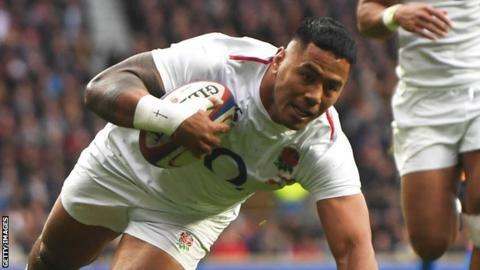 Tuilagi returned to the England side in November after a lengthy absence through injury and made his first Six Nations start in six years in the victory over Ireland in Dublin. Tigers head coach Geordan Murphy told BBC Radio Leicester: "I'm really pleased, Manu is a world-class player and he was being offered some huge money by Racing 92. "It restores my faith in rugby a little bit because Manu has accepted a massive pay cut to stay at Tigers, but as he said, he wants to be here, he wants to contribute, and he's excited about what we're trying to build. "It speaks volumes of him, the loyalty he has shown to us now is immense, and I know he feels that the club treated him very well, and supported him." Leicester and England team-mate Jonny May said the situation had been playing on Tuilagi's mind. "It probably would have been quite stressful for him, but we're all happy with the decision he has made," he added. "It hasn't been great at Leicester, but this is a bit of news that can hopefully give everyone a lift. "When things are going well or good things are happening, more people are interested in coming along or staying. When things aren't going well or bad news is coming out, it has the opposite effect. "So having someone like Manu staying means other guys might think, 'I want to stay now'. It does work like that."